Zombie Boy - Page 4 of 37 - The Unlife of the Party! This is what happens when you yap too much! I met Chris Flick at the 2016 Baltimore Con, and I mentioned to him how much I’ve appreciated his many contributions to the business side of tabling at conventions, and it inspired Chris to publish his latest masterwork, The Essential Capes & Babes. 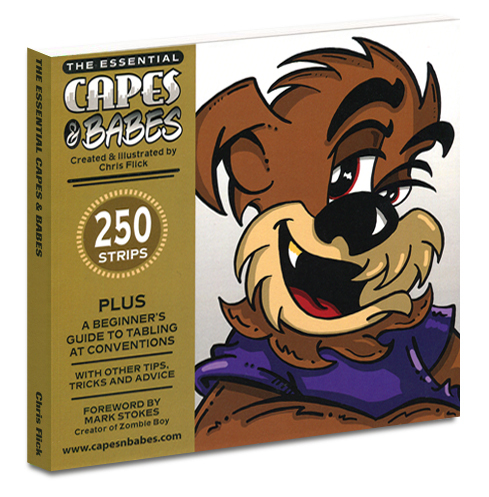 This 250 page treasure trove of choice Flick Capes & Babes comic strips includes “A Beginner’s Guide to Tabling at Conventions,” sixty pages packed with pro advice from someone who has tons of first-hand experience. It’s recommended reading for anyone who wants to make the most of their convention tabling experience. Chris graciously asked me to write the foreword for this terrific tome, and I did the best I could. I’ve been a fan of Chris Flick for many years now, becoming especially familiar with him through his involvement with the Webcomic Alliance and their amazing podcast, a tremendous resource for comic creators. Chris is a consummate creator, a graphic design veteran, generous with his talent and knowledge, a podcast personality, a man to be reckoned with on many levels! 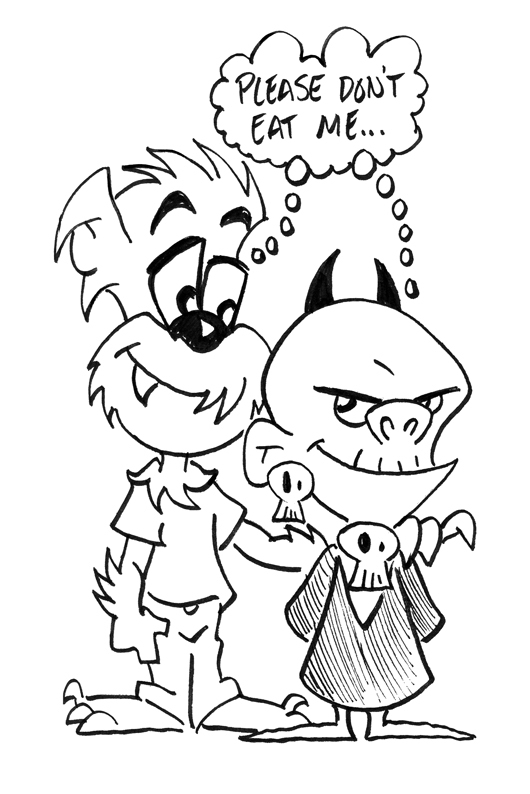 And as an added bonus, Chris graced my copy of his latest masterwork with this drawing of Roy and Zombie Boy. It couldn’t just stay in there, it HAD to be shared! Monstrously good, don’t you think? (I especially love the Grinch-like feet he gave ZB!) Thank you, Chris! 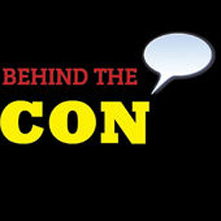 Recently at the Dallas Comic Show, I had the pleasure of being interviewed by Dax Stokes (we’re not related) on his wonderful podcast, Behind the Con. Dax speaks with folks at fan conventions, comic cons, and horror shows and gets behind the scenes with questions about the fan experience. 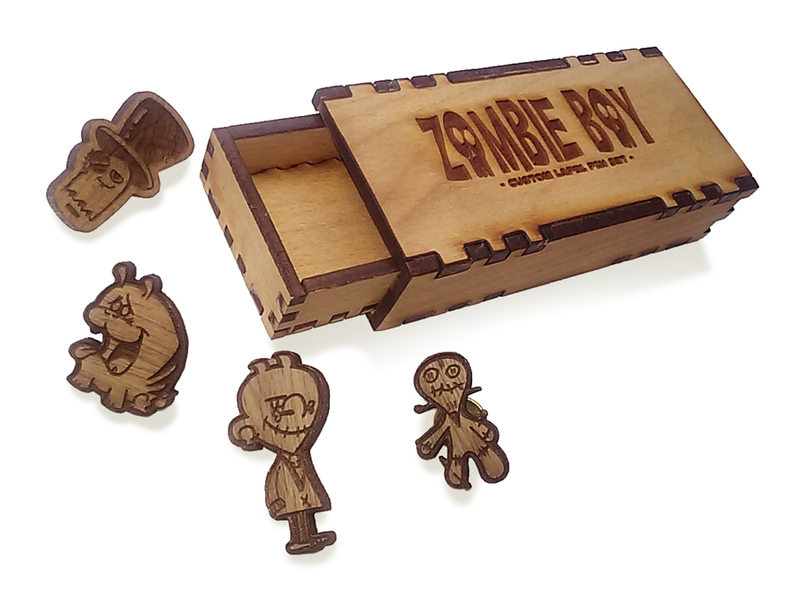 We spoke about zombies, voodoo, and the origin of Zombie Boy. Dax is also the host of The Vampire Historian Podcast, an entertaining and informative listen that takes a bite out of all things vampire. Thanks, Dax! I have to admit, Brendan Boughen‘s drawings just make me laugh. And I’ve not even started talking about his gags, yet. Brendan’s characters have that wide-eyed enthusiasm that just brings a smile to my face. Brendan, who creates cartoons using his nom de plume, Jim, writes about what he knows and he hits his mark with precision every time. As a public relations consultant for major technology brands, his PR mind and his wild cartoony aesthetic mingled together and produced this gem of a collection. You can order a copy of this treasure here. 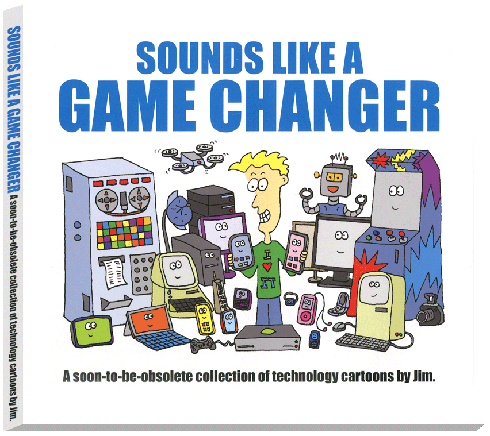 Brendan is currently working on a 30-year retrospective book of his work, and possibly a sequel to Sounds Like a Game Changer. 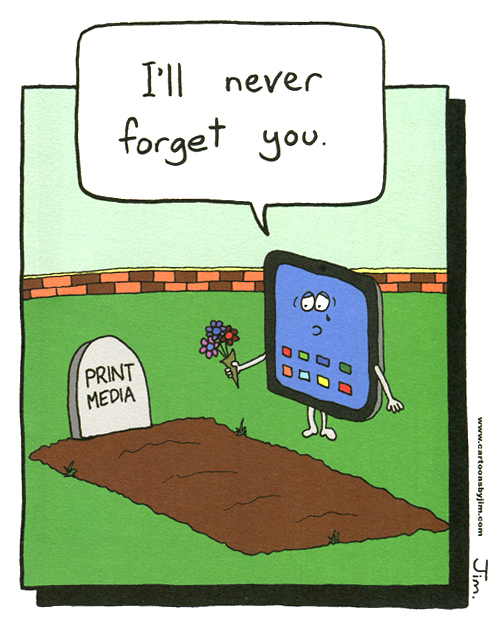 He is also creating cartoons for the weekly IT Professionals NZ blog, which can be found here. 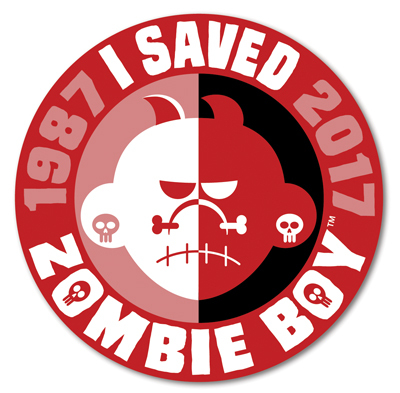 As many of you may already know, I’ve been working with Zombie Boy since 1987, publishing various comic books featuring the character from the late 80s and into the 90s, and in this webcomic since 2010. In 2015, I Kickstarted a book collection of my comic strips, Zombie Boy Vol. 1: Some Kind of Horrible. In 2012, I attempted to file for a trademark for “Zombie Boy” and was informed that a company was already in the process of applying for the “Zombie Boy” trademark in four goods and services classes. This would effectively monopolize any print, merchandise or media I may want to produce using the name. I was told by the Trademark office that all I could do was wait until the applicant filed a Notice of Publication and I’d have a window of 30 days to file a Notice of Opposition. The Notice of Publication published on Jan. 31, 2017 and I’ve since filed an extension of time to file a Notice of Opposition and oppose. I have to enter my Opposition and pay the fees by April 1, 2017! Making a living as an artist is a wonderful thing, providing me with food and shelter, but it doesn’t help much when something like this comes along. So I’m asking for help. April 1, 2017 is coming up quick! I started a GoFundMe campaign, you can find it here. 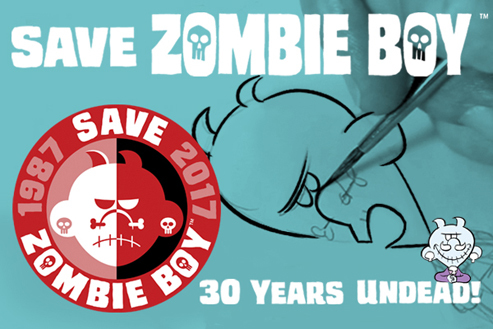 If you pledge at the $10 level, I’ll send you a custom made “I Saved Zombie Boy” sticker. Talented creator, Darrel Troxel, a purveyor of hilarious and wonderful things, surprised me with this priceless gift recently. 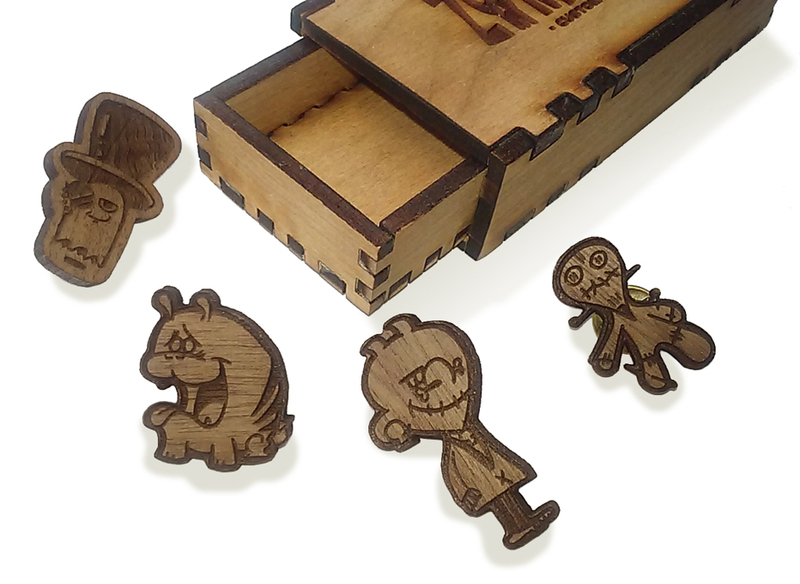 He hand crafted it out of wood with the help of a laser in magical Raydred Studios, Darrel’s independent studio that produces limited edition artwork, prints, lapel pins, and other handmade items. To say that I was impressed would greatly underemphasize how I felt when I opened the package he sent. 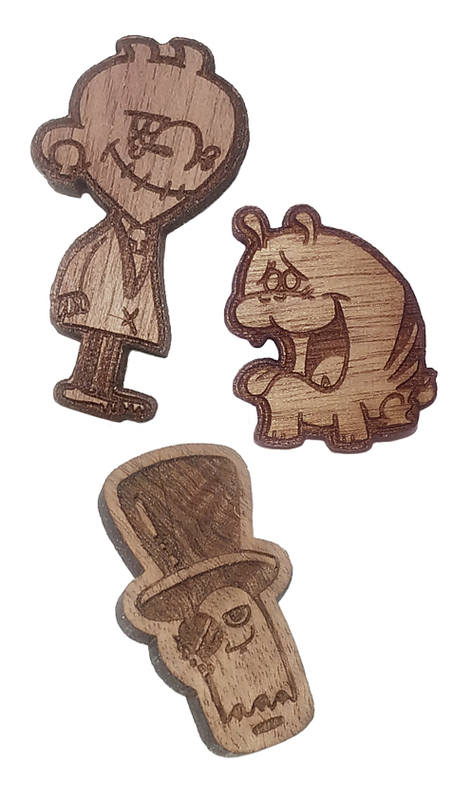 It is exquisite, with its accurate recreation of the Zombie Boy logo and the line work on the lapel pins, which feature Zombie Boy, Gorr, a voodoo doll and Ghosty Von Mortis, Darrel’s original creation. 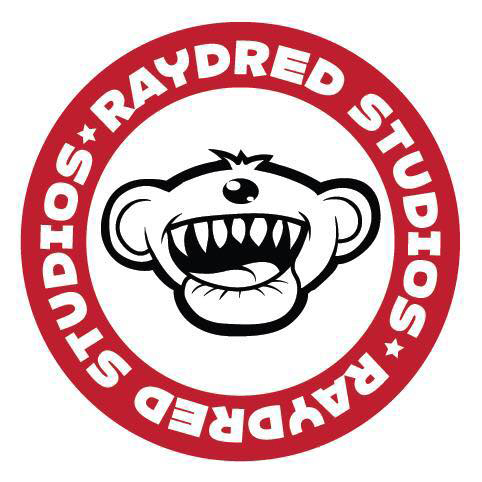 You can find Darrel’s Raydred Studios on Facebook here, his website, That Comic Thing, and you can order his book, There Are People Living Inside My Head! on Amazon here. Thanks, Darrel!